NABARD came into existence on? Etawah pilot project was started in? Second nationalization of commercial banks in India took place in? Correct year of Panchayat Raj inauguration in Rajasthan state ? Community Development programme was started in the year of ? NATP(national agricultural technology project) was started in the year ? Paramparagat Kirshi Vikas Yogana was started in India in the year ? The Agricultural Price Commission was set up in the year ? When did the Second phase of “Operation flood” take place? The Agricultural Produce (Grading and Marketing) Act was passed in the year ? “Project Tiger” in India was started in the year? Project Elephant was launched by Govt. of India in which year ? Which of following year was declared as ‘The International Year of Soils’? Ozone day is observed on? The Agricultural Price Commission was set up in which year ? NAFED was established in which year ? 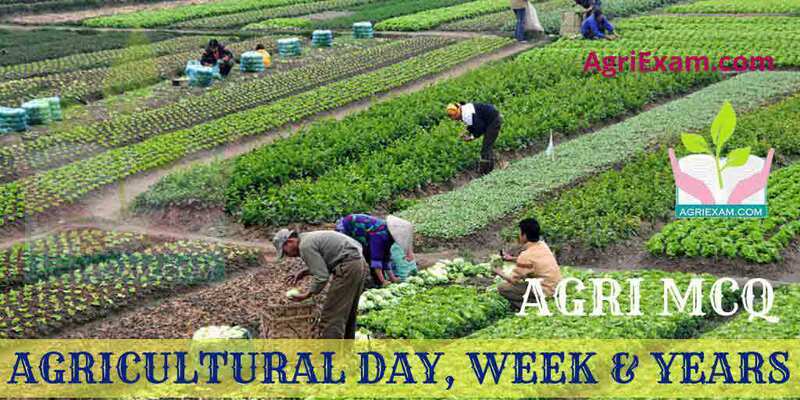 In India, first separate department of agriculture was established in? National Agriculture Insurance Scheme was started in? First KVK in India established in Pondichery in the year? Intensive Agriculture District Programme (IADP) was launched in which year? LAB to LAND programme started in the year? The first Krishi Vigyan Kendra, on pilot basis, was established in India at Pondicherry in the year? Building of IARI was damaged due to earthquake in the year? DDT was first synthesized by Dr Paul Miller in which year? As per the Government of India year 2018 is observed as? In which year, NABARD was classified as “Development Bank”?